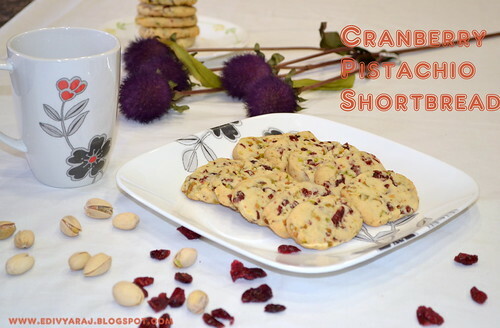 Chop the pista and dried cranberries. Mix all purpose flour and salt and keep aside. Add vanilla extract and mix. Stir in the flour-salt mixture and mix gently. 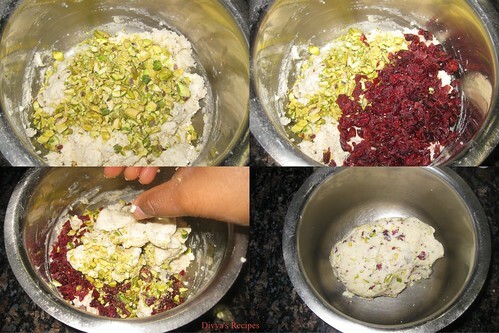 Mix to combine.If the mixture is crumbly,use a few drops of water to form a dough. Place the dough in a parchment paper and shape it into a rectangle about 10 inches long and 2 inches wide. 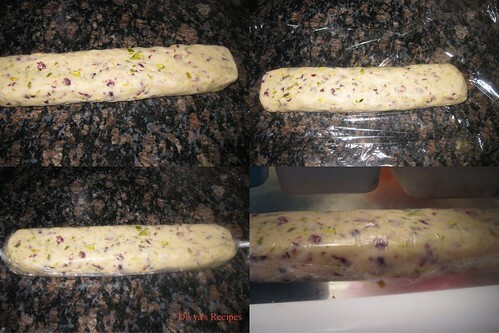 Wrap it and place in refrigerator for 2 hours. Preheat oven to 325F with the rack in the center of he oven.Line two baking sheets with parchment paper. 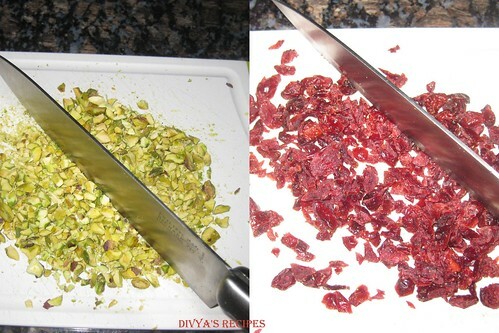 Remove dough from refrigerator and slice into i cm thick slices. 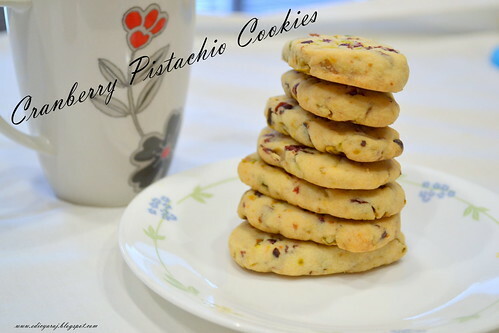 Place the cookies on the prepared baking sheet,spacing about 2 inches apart.Bake for about 15 - 2o minutes,or until the cookies are just beginning to brown around the edges.Remove from oven and cool on a wire rack. Tasty and colorful cookies ready. 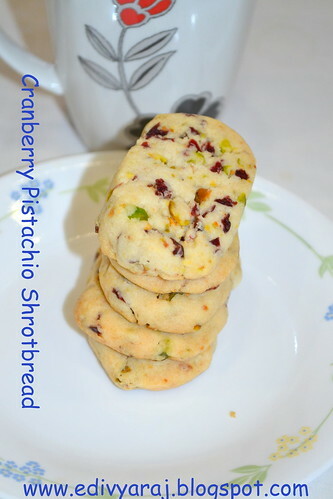 The cookies look so colorful and very tempting..
Gorgeous and super buttery shortbreads,would love to munch some. 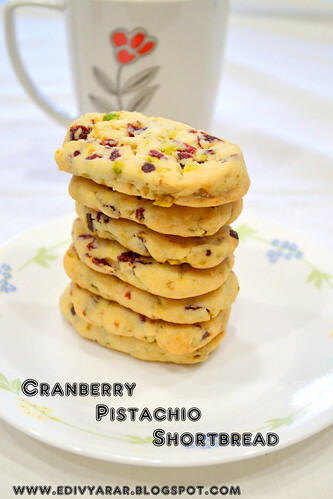 Beautiful cookies, great with chai, I love the addition of cranberries. I really admire those blogs and owners of those blogs who have this patience to take step by step pics and post it so nicely on blog, making it very easy for readers to follow. When i am cooking, it gets very difficult for me to take in-the process pics. Washing hands million times before using camera and in the way spending more time in kitchen. 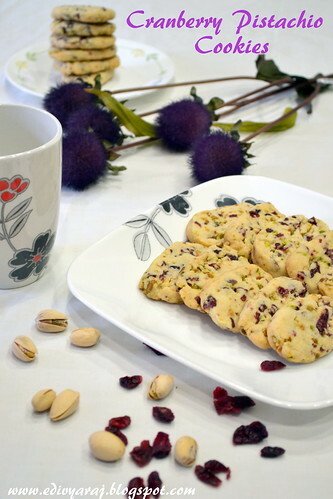 The cookies look so lovely ! Woow..melt in mouth goodies!! tempting clicks tooo..
Looks colorful and I bet it tastes yummy!! you photo's are very detail. Easy to follow. p/s : i'm organizing my 1st giveaway, hope you and your follower can join it. Thank you. 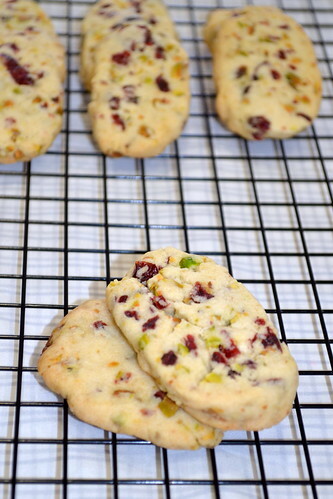 loved you cranberry pistachio shortbread. simply superb.....nice and easy recipe. Sounds too good,perfectly made it!! wow, looks so tempting. parcel me some pl. Looks awesome and perfect.. very beautiful captures !! love that combination of dry fruits .. looks very tempting! 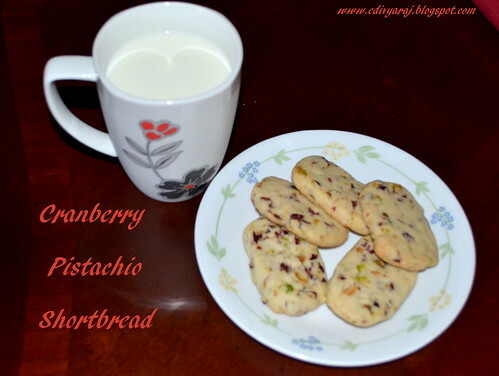 Wow Divya, delicious and mouthwatering cookies! Looks fantastic! Wow, lovely pics, great effort and mouthwatering recipes. have to follow you to keep coming back. Very nice cookies Divya. Festive look and yummy! Great combo and looks fabulous! Thats a perfect batch of cookies you have there. Very tempting clicks. Love the detailed pics.